Reading has been the common practice since the time immemorial, but now with the change in time and advancement of technology, the students, adults and children are avoiding books and are addicted to the tech savvy things like smart phones, etc. They are more tethered to the computer, phone screens and hardly know the joy of reading, spending some time in the beautification of going through the interesting books. 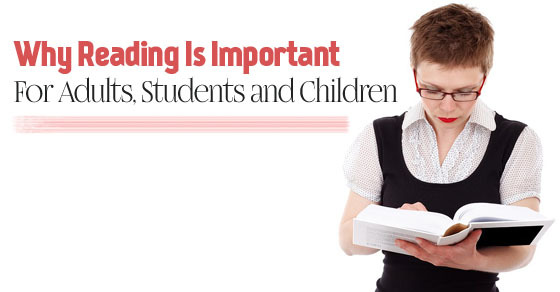 Here we have discussed few tips on why reading is important for everyone. Reading is one thing which can give you the glimpse of the whole world without even moving an inch from your place. There are lot many other benefits of reading books, magazines or any other readable stuff. When you read, you get to know many things which you might not have come across otherwise. So, by reading, you will be able to enhance your knowledge. With bits of information, you are able to fill up your head. The more you read, the more word you come across and they make the way into your daily life. When you start making use of the good words in your day to day life, you tend to feel satisfied and happy. Being able to speak well with a good vocabulary, you feel confident and also it is the key to any successful profession. Not just the words, but also many dialects and languages are learned. When we read ourselves, we tend to remember that for a longer period of time but when we just hear from someone, it does not make a long lasting impression on our mind. So, in this manner it also helps in learning varied languages. The level of patience increases. When you have a good thick book of 100 pages, you wish to complete it but with patience to know the indepth meaning of each line and the word in it. So when this attitude of understanding every single word comes to mind, the patience develops ultimately. No matter what type of book you read, every book relaxes your mind and brings peace into your mind. It brings a change in your attitude with the subject you read. For example, reading spiritual content lowers the blood pressure and going between the lines of self help books assist in knowing various solutions to the inevitable problems in life. So, not just the problems are solved, but also the life in that particular moment of ecstasy, the peace is experienced, forgetting all the issues in life. So, above are some of the reasons which tells the reading importance for everyone. No person in life should restrict himself or herself by reading any book. Many qualities are incorporated within an individual that might not be inculcated through any advice from parents and others. Why is Reading Important for Adults? Reading is not just helpful for the younger generation, but also for the older ones and adults. The adults must read a lot as reading keeps them up to date with the change in time. If they do not read, they will be left far behind the time of the youngsters and it may leave them feeling embarrassed. The best answer ever for “what is the importance of reading” is to be updated or awareness.The importance of reading for adults creates awareness. They come to know what is happening in their surroundings. For example if they read newspapers, they will come to know about the recent development of the country, the new schemes and also the mishappenings occurring in the nation. Adultery is the time when most of the students go through their love life which almost leave them in stress, over thinking, killing precious time. This leaves them depressed and sad. So, in those situations, reading helps in shedding away all the stress and one feels relieved for at least the time when one is reading. The adults are more prone to tensions and also stress. The reasons can be many like academic failure, stress of choosing the right career for the settlement in the future, pressure from parents to perform better and so on. Whatever may be the reason, reading helps in diverting the mind towards positivity. Little knowledge is a dangerous thing. So, if you just listen to one or two lines from someone about any particular subject, it will never do any good to your knowledge, unless you go in depth of the whole subject. So, it is better to inculcate the reading habit so as to understand the subject in depth. Reading is one thing which gives you countless solutions for solving the difficult situations that arise in life. Whether you read a novel or any biography, it teaches you something. For example, it gives you motivation on how to cope with difficulties or it helps you in knowing what struggle the great personalities did and how they won over the troubles. The adults are meant to be the pillars of the country who will move out and fight for the nation. For that they need to know what Is going so that they are able to take a concrete stand against the odds in the country. Also if they are well informed, they feel confident to stand in front of other intellectuals. This way they learn to live in a society which always demand the truth to stand erect leaving the false and odd to bow in front. So, above are some of the reasons which show that even the adults must go through different books and magazines as there are many advantages of reading books. It’s not particularly about reading books, rather you can read anything which gives you immense knowledge, such is the value of reading. Even a single line can help with the motivation and can change your life. Why is Reading Important for Students? There are many reasons why reading is so important for students. This is because nowadays number of changes are coming in the society and some of those changes are positive while some are negative. Whatever is the change in the society, one has to keep themselves updated with those. Here overall developments means personality development. When a student reads, he develops into a different human who is able to stand out from the crowd. The brain develops in a positive manner. The brain functions well because when a student reads, lots of questions arise in mind and that curiosity of getting answers increases knowledge. When a younger person starts reading, they become not only better in reading, but also they develop mature thinking which makes them mature and wise. Also, any activity which requires a good deal of thinking is considered to be beneficial for the betterment of the student. When the students read, reading improvement happens as well as they themselves improve their vocabulary and spelling. Often students tend to make number of spelling mistakes during dictations but when they develop the habit of reading, there comes no spelling mistake and also they learn the synonyms and sentence formation. If a student reads English, then in that particular language only the student gets command. If it’s any other foreign language like French, Spanish or Indian language like Hindi, Punjabi and so on, the person tends to have flow for that language. It becomes a positive point and is appreciated later in the life. The reader comes across various little things like non fictions, fiction, etc. Even if one is not reading a true story, a great amount of new information is learned. Some are also the historical fictions which at times inspire a lot as they tell how the people in the past did not have any means of recreation so they used to read maximum books to pass their time. Also, they did not have an easy access to education , so they used to read full newspapers to keep themselves updated with the information. So, above are some of the points which clearly define why is it so important to read for the students. The parents must drive their students towards reading as they are the first teachers and if they themselves will not motivate their wards, then how can it be expected from others about the motivation. Why is Reading so Important for Children? When a child is asked to read, he or she builds intimate relation with the books which helps in the well being of the child. Also when the child reads a lot, he becomes curious of knowing more and more, which further motivates him to read and study. Whenever your child seems stressful, read to him or her a descent fairy tale or any other comic book so as to relieve him or her from any stress. Reading not only says to go through the intellectual books, but one can read anything which comes the way. When you read to your child, he or she tends to ask a number of questions. Those questions and answer session helps in reducing the communication gap between the mother and the child. Hence builds a great and strong bond or we can even say that it helps in building healthy relations. Reading not only helps in increasing knowledge and vocabulary, but also builds the imagination of kids and improves listening skills. When a mother reads to her child, the child listens it carefully with full interest which helps in constructing good listening as well as improving memorizing skills. Many studies have said that the children who do well in school are often those who were exposed to reading books before joining the school. Not just this, it also promotes longer attention span which is vital for the kids to build the concentration level. The brain of young children is developed as they come across various colours, shapes, letters, sentences etc. also through reading the parents get to know the interest of their children. Their likes, dislikes are known which ultimately helps in overall development of the children. The books teach your child relationships, personalities, different situations, and also diffenciation in good and bad things and circumstances. Fairy tales and the fictional stories teach your child to know what is real and what is not real. When your child has grown with reading books, he or she learns that reading is too much fun and not a burden. So, when your child grows up, you will not have to stress on asking him or her to read, as he or she himself will read knowing that reading is too much fun and pleasure. So, above are some of the benefits of reading for children. Reading is not restricted to any age or any gender. Anyone can pick a book and read.